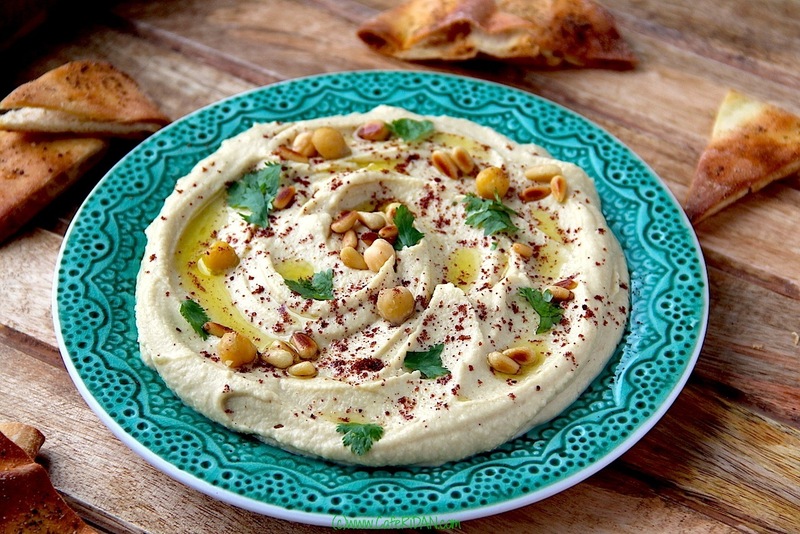 Hummus is one of those versatile dishes that can be used as an appetizer, snack, a dip, spread or as a side. I usually have a jar of hummus in my refrigerator and I change it up often by adding different ingredients to it. While classic hummus is my favorite, I also like cilantro jalapeño hummus and roasted bell pepper hummus. This hummus infused with truffle oil happens to be Karan’s favorite. Honestly, he loves anything with truffle! I like to use fresh chickpeas but if you are short on time you can also use canned chickpeas. For this recipe you will need two 15-ounce cans. Just make sure you rinse the canned chickpeas well with water before using them to wash off the preservatives. The texture of hummus is also a personal choice. I like my hummus creamy but some prefer it slightly chunky. Feel free to blend the hummus to whatever consistency you like. Truffle oil has a garlicky, earthy, pungent and almost musky aroma and is absolutely delicious to taste. It is used as finishing oil in a lot of foods like fries, pasta and risotto. A little bit goes a long way. Enjoy this hummus with freshly toasted pita crisps or as a dip with carrots, cucumbers and celery sticks. Rinse chickpeas and soak in water overnight. The next day heat a large pot on medium heat. Drain the soaked chickpeas and discard the water. Add chickpeas to the pot and add baking soda. Stirring constantly sauté the chickpeas for 5 minutes. Add 1 teaspoon of salt and 6 cups of water. Bring it to a boil. Cover and cook on medium heat for 30-40 minutes until the chickpeas are tender. Drain the chickpeas and allow them to cool to room temperature. To the bowl of a food processor or blender add the chickpeas, tahini paste, garlic, lemon juice, extra virgin olive oil, truffle oil, 1¼ teaspoons of salt and ice cold water. Blend until smooth puree. Absolutely loved the homus! I have made homus for years and never thought of adding truffle oil, and now can’t have it any other way!! !